This is by far the most popular trip we run. Scuba Club Cozumel is one of the only dedicated dive resorts on the island of Cozumel. You enter through a Spanish-style arched entrance and step into another world. Tiled courtyards, splashing fountains and blue ocean set the scene for a week of total relaxation and stress-free diving. The resort has 55 rooms tiered around two courtyards and the ocean. Many have private balconies or patios. Our package allows us to eat all our meals in the air-conditioned restaurant on site. Meals are served at times to accommodate the diving schedule. Below the restaurant is an open-air bar with a small gift shop nearby. Scuba Club Cozumel is also a place to come to relax. For the non-diving hours there are hammocks and beach chairs lining the shoreline with a fresh water pool on site. The main focus of the resort is the dive operation. 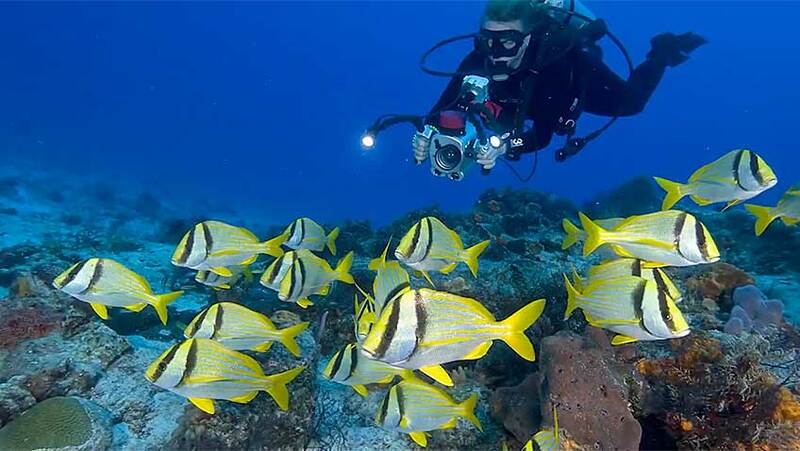 The Scuba Club Cozumel has one of the few on-site dive operations on the island. No need to lug gear, or wait on the dock for the boat to arrive. Boats for morning two-tank dives leave at 8:30 and return between 1:30 and 2:00 pm. The resort has several well-marked entrances for shore diving right off their beach. Night diving off the beach is a fabulous experience as well. Diving in Cozumel is world class. 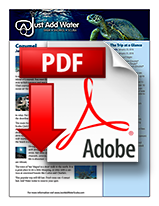 Most all of the boat diving is drift diving in gentle currents along a wall — no need to kick or swim. Just relax and “go with the flow.” Walls are interspersed with channels, caverns, swim-through chutes and tunnels. The marine life is abundant — fish, coral, critters, pelagics — and the colors are vibrant. The town of San Miguel is a short walk to the north. It is a great place to do a little shopping, or relax with a cerveza at renowned haunts like Carlos and Charlie’s. Are looking for a resort destination where your dollar goes farther. Want the comfort and convenience of a land-based resort. May be traveling with one or more nondivers. Are seeking to do more than just dive on your vacation. Our outbound flight departs January 25, 2020 from Cleveland. We return to Cleveland on February 1, 2020.